What is your pupillary distance - P.D? Your pupillary distance, known as the P.D, is the distance between the centre of one pupil to the centre of the other (see diagram). This is used so that the laboratory can place the optical centre of your lenses in the correct position for your glasses. Your P.D is sometimes included on your prescription and we recommend that you ask your optician to include it on your prescription when testing your eyes. If it is not included on your prescription then you can measure it yourself. We recommend asking a friend to do this for you, although it is possible to do it in a mirror. 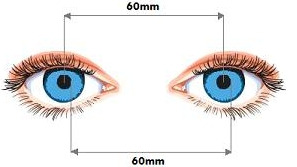 If you cannot measure your P.D then we will use a standard measurement of 60mm for women, and 64mm for men. These standard measurements are often used by ophthalmic opticians when it cannot be obtained, and will always be suitable to allow us to make your glasses.